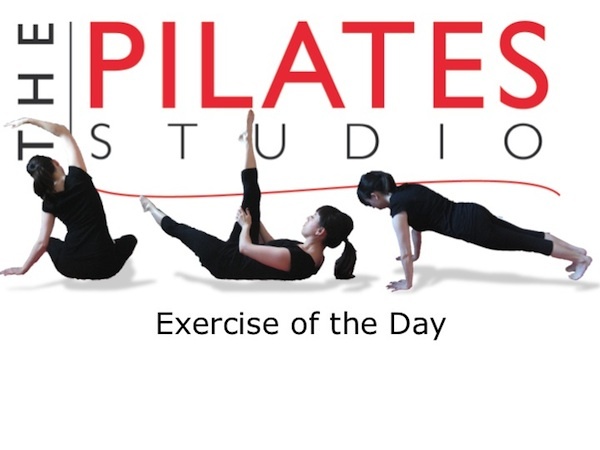 This exercise continues to challenge the stability of the pelvis while moving the leg in the hip socket. This exercise is much more challenging than the previous because it takes away the support of the large exercise ball. Yet it is easier than tomorrow’s exercise which will work to challenge the body further. To do this exercise you will need a mat. Start by lying on your back and with one knee bent and the foot planted in the ground, the other leg is also bent but you hold it in a tabletop position. As you inhale begin circling the leg in the socket towards you, and as you exhale continue the circle by opening the leg out to the side and then lower it down away from the torso. Then begin pulling the leg up through the center as you inhale and begin the circle again. On the exhale be sure to engage the pelvic stabilizers that you found in yesterday’s post. These stabilizers will keep the pelvis still and prevent the pelvis from rocking from side to side. Do 3-5 repetitions in each direction and then switch legs. Continuing to inhale as you circle the leg towards your torso and exhale as you engage the pelvic stabilizers to counter balance the weight of the leg as it circles away from the torso. The pelvic floor plays a major role in stabilizing the pelvis in this exercise, but it is also important to be aware of the internal oblique abdominals as well. The internal oblique opposite the leg that is moving will counterbalance the leg and keep the pelvis from going for a ride.